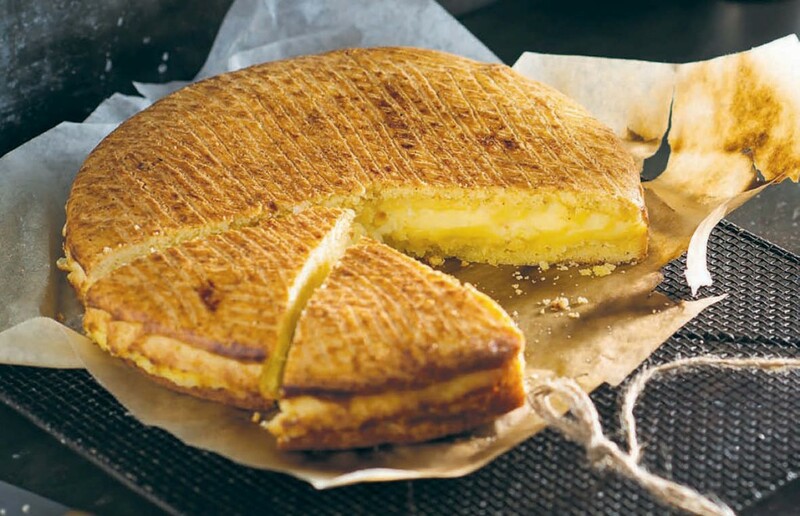 A classic dessert from the Basque region, this recipe from the book Luke Nguyen’s France features layers of cake that sandwich a rum-spiked creamy custard. The filling is also often made with jam or preserved fruit. ✽ Combine the eggs and sugar in a mixing bowl and whisk until the sugar has dissolved. Add the flour and whisk for another three minutes or until it’s smooth and thickened. ✽ Heat the milk in a saucepan over a medium heat, until it’s bubbling round the edges. Remove the milk from the heat. ✽ Slowly pour two-thirds of the hot milk into the egg mixture. Whisk, then pour the mixture back into the saucepan. ✽ Whisk the mixture over a low heat for three-to-four minutes or until the custard boils and thickens enough to coat the back of a spoon. Transfer to a mixing bowl, then fold the rum through. ✽ Chill the mixture in the fridge until it’s cold, otherwise it’ll be too runny to spread properly, covering the surface of the custard with plastic wrap, to stop a skin forming. ✽ Place the butter, sugar and a pinch of sea salt in a large mixing bowl. Using your hands, crush the ingredients together until well combined. Add the eggs and extra egg yolk, using your hands to combine. ✽ Add the flour and yeast, and continue mixing with your hands for two minutes, or until combined. Scrape the mixture onto a floured work surface and knead to form a smooth dough. Wrap in plastic wrap and rest in the refrigerator for six hours or overnight. ✽ Preheat the oven to 200°C (400°F). Grease and line a round, 23.5cm x 4cm (91⁄4” x 11⁄2”) baking tin. ✽ Remove the dough from fridge and cut in half. Set aside one portion. Knead the second on a floured work surface for one minute, to soften it. Using a rolling pin, flatten the dough into a round base, about 5mm (1⁄4 inch) thick. Using a 24cm (91⁄2”) round cutter and a small knife, cut the dough into a circle. ✽ Place in the prepared baking tin, then spread the custard over, leaving a 1-cm border around the edge. ✽ Repeat the rolling and cutting process with the second portion of dough. Gently place on top of the custard, then press lightly to seal the edges. Brush the surface with the extra beaten egg white. Using a fork, make a crisscross pattern over the top of the cake. ✽ Bake for 40 minutes or until golden brown. Serve warm or chilled. From the book Luke Nguyen’s France, A Gastronomic Adventure as seen in FrenchEntrée magazine.